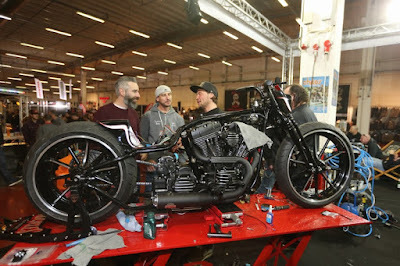 Martin Becker or MB-Cycles might be new name for you, but one that needs to be recognized: His way into the top adresses of German customizers was planted with the 2016 win at the annual CUSTOMBIKE "Build-Off" where "Murder One" was assembled in a 2 and a half day head-to-head scramble against France's "Team EMD", followed by top-position in every bikeshow the unique handcrafted "one-off" participated, including "Best radical" at the prestigious Bike and Music Bikeshow in Geiselwind/Germany in August 2017. The success did not go unnoticed by others and while the "Build-Off" bike saw already some support by sponsors, Martin Becker has been choosen to design and build one of Custom Chrome Europe's 2018 "Bolt On and Ride" bikes! While that is still "under construction" and – as the theme demands – probably not as radical as "Murder One", but certainly with his special love to detail and super-clean look! restrictions and laws are followed with the typical German blindness for obedience and 110% accuracy. And checked and controlled too. But Martin Becker is not one to give up that easy! 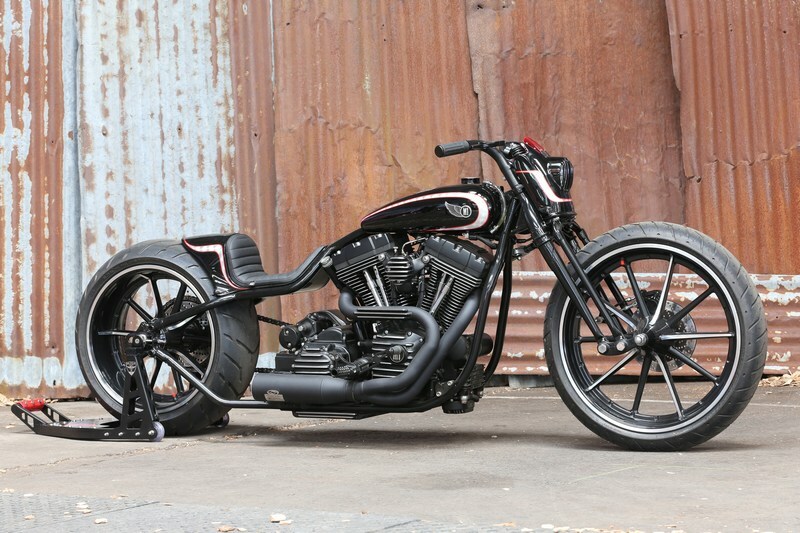 The extreme character of the bike might evade the superficial look, but not the "insider" and not when getting any closer: This is one of the few Twin Cam 96's that delivers its power through a Evolution-era 5-speed gearbox and a Shovelhead chain drive – all mounted in a one-off rigid Lowrider frame that could have been found in this style in many 60ties/70ties Dragbikes, roaming the Dragstrips of the USA 50 years ago! 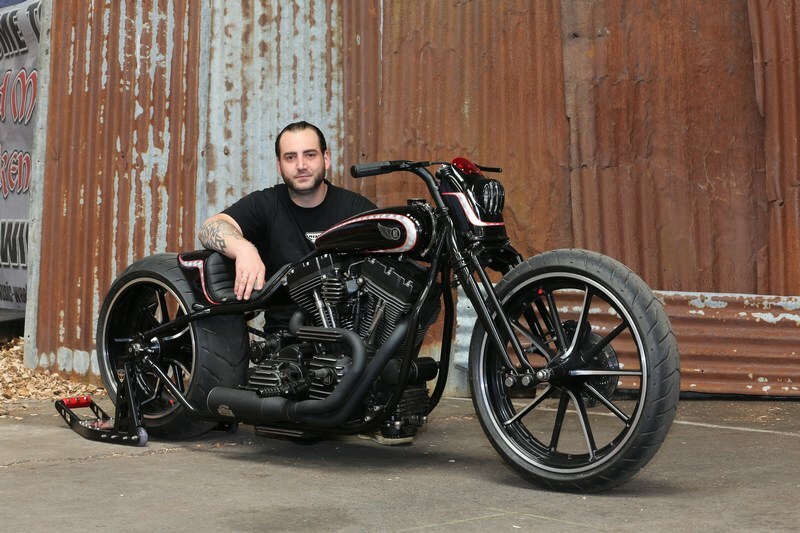 With the bike to be assembled – and the electrics to be created "live on stage" – in a two and a half day timeframe, everything else should come prepared perfectly: Which suits Martin Becker, who's passion is into sheet metal fabrication. 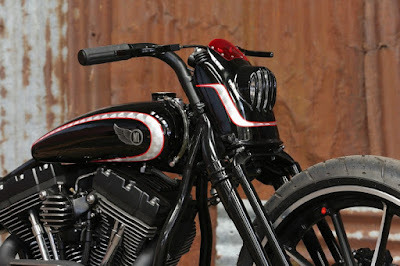 Which is the reason that all components of the sparse bodywork, tailend, headlight mask and tank are hand-hammered, the latter a cut-down version of the classic "Super Glide" tank wich is even smaller than the outline may indicate. There is a lot hidden under the tank! Before the sheet metal was cut and shaped, the Twin Cam 96, originating from a touring model, was taken apart to the last nut and bolt, granting a better-than-new balancing of the crankshaft and reliability well beyond stock. "Ribbed" covers came from their on-stage competitor EMD, details like the ribbing on the rear cylinder pipe and the handcrafted airfilter were crafted to match the style. With perfection! 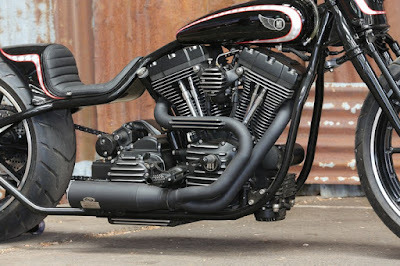 If you get close and low, you notice the oiltank which is located under the rigid frame, stretching from motor covers to gearbox. The Twin Cam motor case has been modified with a custom-made backplate where usually the Twin Cam gearbox is bolted directly to the lower case of the motor. The downtube to which the rear part of the motor connects also serves as part of the oil tank reservoir, the right side even with a window to check the oil level. Motor and gearbox are connected with a MB modified Primo belt drive: The added ribbing seems to be hanging in the air and makes the left motor side more attractive than on most other Twin Cams. The unique frame to mount the revised motor and gearbox was bent by Dutch VG-Motorcycle (www.vgmotorcycle.com), a long-time specialist in building replica, custom and one-off frames in grade a homologated quality. With the 2016 date of creation, a street-homologation ain't impossible, because that year ABS wasn't required yet. 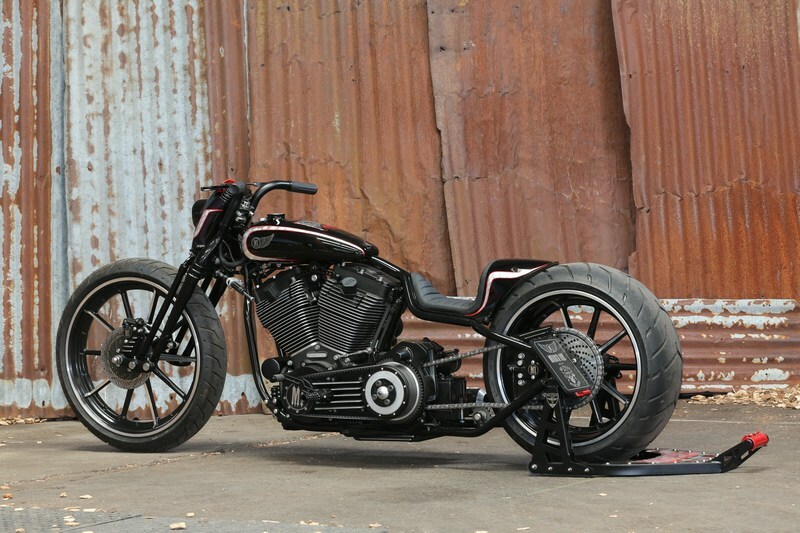 A few inches of stretch in the tailend section of the frame offer that Dragstyle look, which is underlined by the absence of any accessory or part above and behind the gearbox. That huge empty space alone is an outstanding achievement, made possible by the conversion of the fuel-injected Twin Cam to S&S Super G carb and the subsequent minimisation of the electric system. Even more remarkable – for the short time in which the entire electric system was wired – is that all cables and connectors are hidden in frame, handlebar, fork and body parts – almost completely out of sight. Even the brake lines are mostly hidden and the brake cylinder for the front disc is hidden under the flat tank, cable operated like the internal Müller throttle. While the stretch in the tail section of the frame is visible – and smartly dealt with by using chain drive with a frame-mounted chain-tensioning sprocket – there are also serious modifications in the Springer-style front end. To cut down the budget, MB opted for a set of stock "Breakout" HD wheels – and they look just as designed for this bike. To highlight the clean wheel design, Martin moved the wheel forward approximately one Inch by machining new and longer "swingarm" levers. But the added lenght also resulted in additional force on the springs, which consequently had to be swapped for new and stronger fork springs. 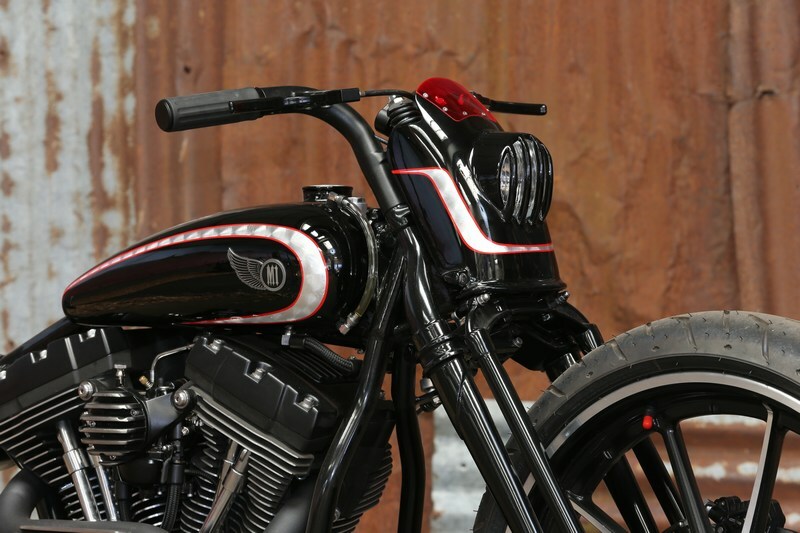 The amount of detailling and new ideas in this custombike is remarkable – and the style somewhat timeless: While the mix of "Old-School" and "Dragstyle" in amplified by the clean look and a decent paint job by Chiko's pinstriping. The mandatory "German black" compliments the machined sections of metal and silver leaf, the MB logos on the tank are laser-cut from stainless steel. There is little doubt that MB Cycles will surprise Custom Chrome Europe with a extraordinary 2018 "Ride Unrivalled bike in spring 2018, Martin Becker is a name to be recognized. What the images don't reveal, the bike is also a "tribute bike". While the name "Murder One" is fitting the look and the performance perfectly, it is in memory of one of the true rock-legends, lost one year before the Build-Off took place: Lemmy Killminster, bassman, founder and heart of "Motörhead". With the usual "Lemmy humour", he christened his favourite Bass amp – a 1976 built 100 W Marshall "Super Bass" tube-operated amplifier, slightly "customized" – when rocking the crowds worldwide. The name: "Murder One". 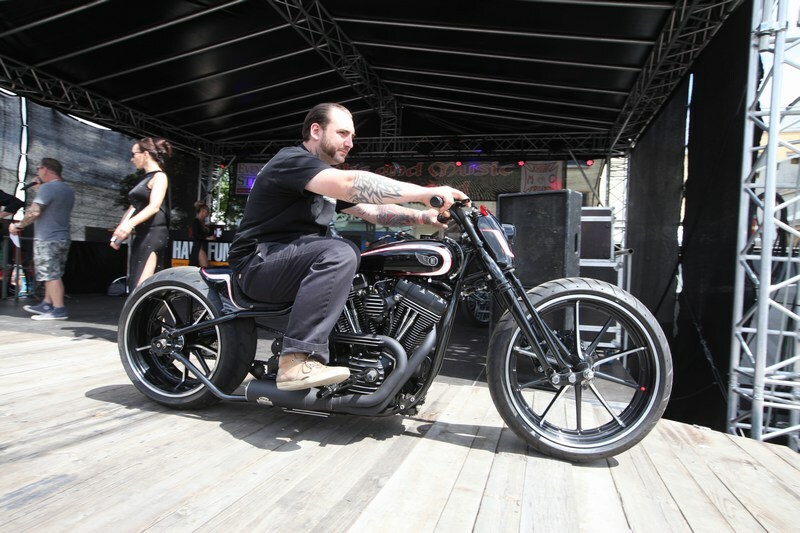 Text: Horst Rösler, Images: Horst Rösler/Motographer, photographed at CUSTOMBIKE 2016 and "Bike and Music Weekend 2017"
Block/Lower end/Bas moteur/onder blok/Blocco Motore/Carter: Twin Cam 96, modified by MB Cycles for Evolution Gearbox. Tank/Gas Tank/Réservoir d'essence/tank/Serbatoio/Depósito: MB-Cycles, one-off, modified from Super-Glide 80ties style tank. Tank badges one-off laser cut. Sonstiges/Other/Autres/ovenig/Altro/Outros: MB-Cycles sidemount license plate, Carboni red windscreen, motogadget instrument, Ready to ride! Airbrush-Gemälde/Design/Airbrush Art/Design/Peinture speciale/ontwerp/Aerografie/Artista: Silver Leaf inserts, pinstiping and lettering on top of the tank. Sonstige Bemerkungen/Other/Autres/ovenig/Altro/Outros: Super clean look!